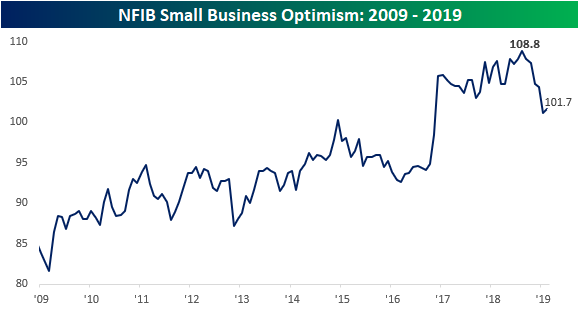 After the steepest five month decline since the Financial Crisis and the longest monthly losing streak since 1998, NFIB Small Business Confidence rebounded in February, although by a less than anticipated degree. While economists were expecting the headline index to bounce from 101.2 up to 102.5, the actual increase was much smaller at just 101.7. As shown in the chart below, while the index was higher this month, it hasn’t put anything more than a small dent into the decline we saw from the high back in August of last year. From a longer term perspective, the recent decline from the August 2018 high is definitely severe relative to prior declines. 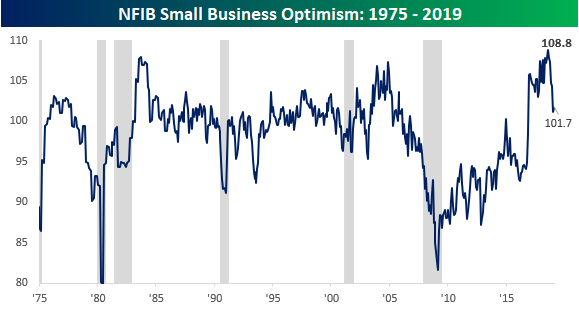 What we noted following last month’s report and is worth reiterating again is that prior periods where we have seen a quick and fast drop in small business sentiment haven’t been particularly good at timing downturns in the business cycle. While recessions typically are accompanied by a sharp downturn in business sentiment, there have also been plenty of other periods (1984, 1993, and 2005) where we saw sharp declines in small business sentiment but were nowhere near the onset of a recession. Finally, when it comes to issues facing small businesses, finding qualified employees continues to be the biggest problem they face, and there are some signs that they are starting to pay up in order to find those with the right qualifications. 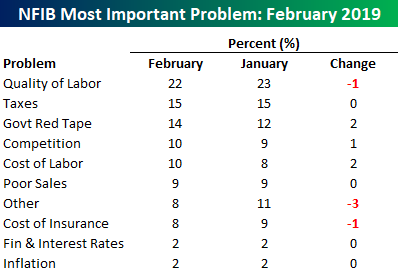 In this month’s survey, the percentage of businesses citing Labor Costs as the biggest problem increased from 8% to 10%.